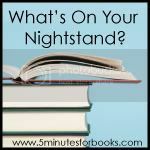 Nightstand - the Dilemma Continues! Well, I think I've done pretty good with fiction this past month. Hmm, then again, maybe I should continue to work on a blend of fiction and non. I confess I fall to the non-fiction much more easily. It just feels more profitable to me, mentally. But that's kinda stupid and I do realize that. It's nice to not only relax into a good fiction read, but really think through it as well. At any rate, despite all that I was able to read this past month, I feel like there's tons more "to do." I confess, I don't really care for the "to do" feeling when it comes to reading. I prefer to the "I'm so relaxed" approached to reading which I seem to experience only a few times a year. I put too much on myself but I haven't figured out how to stop yet! The vicious cycle continues: Carrie relaxes into her reading, then takes on too much all at once and reading feels like a chore, then her TBR stack shrinks a bit and she feels more relaxed - no, wait! - she's piled on more books. With all of that confusion it's a wonder I haven't paralyzed myself from being able to read anything at all! This month I have more non-fiction than fiction on the Nightstand and it starts with two rather interesting titles that I'm quite sure I'll find interesting, annoying and hopefully insightful! These two probably rank as my top "morbidly curious" sort of reads and I can't imagine letting them collect dust for another month. If I keep saying that it will happen, it will happen, right? Isn't that how it works? I much prefer the "I'm so relaxed" approach, but then I would only read fiction! 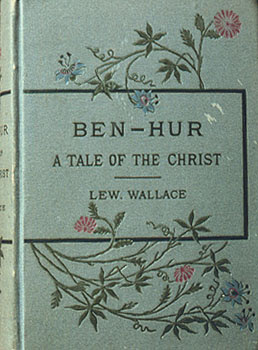 I had to read Ben-Hur my senior year in high school and only had to read certain parts. I got so engrossed in the story that I read the whole book and it has remainded a favorite. I need to re-read it since a loooong time has passed since then! I adopt a 'you'll get to them eventually if you want to' attitude...knowing the books will sit right there or be renewed or refetched when I'm good n ready. My TBR list is there because I want it to be, ya know? No stress allowed lol. That's one reason I don't do a lot of book reviews for anyone other than myself (though I love getting free books out of the deal!) -- I just don't like the pressure, especially if it's not a book I like. I tend to gravitate more toward fiction -- it is more relaxing to me. I like non-fiction when I read it, but I often have to "make" myself read it, except for biographies and such. I read Ben-Hur ages ago and would love to read it again some time. "Carrie relaxes into her reading, then takes on too much all at once and reading feels like a chore, then her TBR stack shrinks a bit and she feels more relaxed - no, wait! - she's piled on more books." Yup. I can totally identify. 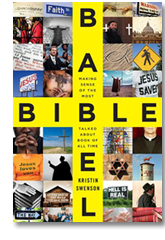 I'm excited to compare notes on Bible Babel! My TBR list has dwindled. I lack a bookstore and Amazon gets expensive! Just saw Bible Babel on another list. Let us know what you think! Oh, I absolutely loved Ben-Hur. Enjoy! Relax! Relax! Relax! Review titles aren't worth getting worked up about. You're a reading machine anyway. The teacher in me just loves the lifelong learner in you! Seriously, people who always want to learn (through their reading or otherwise) are just so interesting to be around! Love your reads, and will be anxious to see your reviews. It's All Greek to Me looks absolutely fascinating. The historian in me wants to read it NOW! Can't wait to hear how you like it. Get rid of that pressure and relax into it! LOL Have a great reading month. I join you in that "morbidly curious" category; can't wait to hear what you think of those! Haven't read "Ben Hur" but want to. Totally understand walking the tightrope between "I'm so relaxed" and "wait! she's piled on more books!" So there, my friend. I am so there. All sound interesting...looking forward to your reviews of them to see if they should go on MY growing TBR pile. I fall more into fiction than non, but right now I'm leaning more towards non-fiction. I haven't even completed half of the book I have to read for tomorrow's book club, but I've had to tell myself to enjoy it and not push through a good book just to have it done. I am the same way. I force myself to read when my TBR pile gets too big, but once I sit down, I don't get back up until the book is finished. I LOVE to read, but because I become so engrossed in it, I feel guilty at times. I've found it challenging since I started reviewing because I feel the pressure of the stack of books. But I have to remind myself that I'm in this for the fun and not to let other titles, some of which I'd never have selected on my own, take up my valuable time. Right now I have books stashed in different places and for reading at different times.